Here’s a modern and feminine take on the cabled sweater. 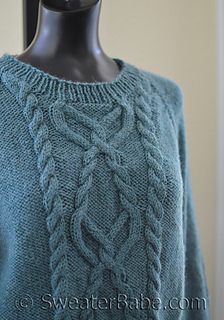 This top-down sweater features a wide, unique cable panel flanked by two smaller cables. A gently curved crew neck is echoed by the curved bottom hems. The back hem is slightly longer than the front hem for a flattering silhouette. Sleeves are slightly belled and full length. If you prefer a straight sleeve, the increases down to the cuffs can just be omitted. 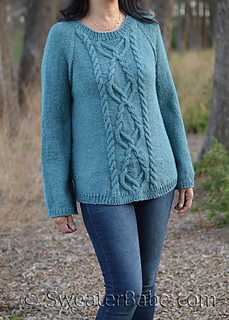 The sweater is knit in a lovely dk-weight merino yarn in a striking teal green shade. The cable patterns are both charted and written out. This is a seamless project, except for a tiny bit of seaming at the bottom hem of the body and the sleeves, if you wish to knit them in rows. Instructions are given for the sleeves to be knit as rows or in the round. APPROX FINISHED BUST MEASUREMENTS: 38 (41 ½, 45 ½, 49 ½, 54, 57 ½)“ 96.5 (105.5, 115.5, 125.5, 137, 146) cm TO FIT SIZES: XS (S, M, L, 1X, 2X) or Bust Sizes 28-30 (32-34, 36-38, 40-42, 44-46, 48-50)” 71-76 (81.5-86.5, 91.5-96.5, 101.5-106.5, 112-117, 122-127) cm.